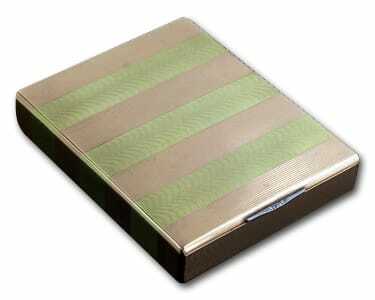 A cigarette case is a box or pouch designed to hold cigarettes. During the 1920’s through the 1950’s smoking accessories were very popular. Elaborate gold, silver and platinum boxes, often studded with gemstones, were created to elegantly transport cigarettes. Not exactly jewelry, they were flashed about in a status conscious way very similar to the way ornate jewelry was flamboyantly worn. To pull a gold box from your pocket or purse, open it and offer it around to your companions was a sure fire way to establish your “class.” Carried by both men and women, they made great gifts for men with plenty of space to engrave that “special” message. In films of the period, smokers could be seen creating an elaborate ritual of pulling out the box, offering it around, removing a cigarette, tamping it on the box a few times, as if to punctuate the proceedings, then flourishing a cigarette lighter to complete the task. What better way to gain close proximity to your date than to offer them a cigarette then lean in to light it? These beautiful smoking accessories were an important cultural icon of the era. Those boxes that still exist have mostly been relegated to private collections and many have been melted to exchange their relatively weighty gold content for cash.